More Mount Snow Glades Please! The 2017/2018 ski season was incredible! From Mount Snow’s opening day on Nov 11th to the closing day it was special. Southern Vermont was battered by New England storms making the glade skiing at Mount Snow one of the best ever. The past few years the Mount Snow crews have been thinning some areas which you can see on the newer Mount Snow Trail Map. Northface, Ridge and Dark Side of the Moon on the South side of the mountain. Sunbrook. I love the glades and so do my kids. 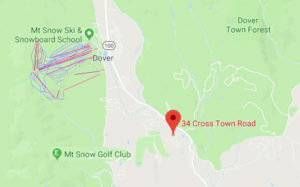 On good snow days that is primarily where you will find us so I though it would be fun to put together my Fantasy Mount Snow Trail Map. See below. Yes! More glades please! The woods to the South of Shooting Star would be a great place for expanded glade skiing. 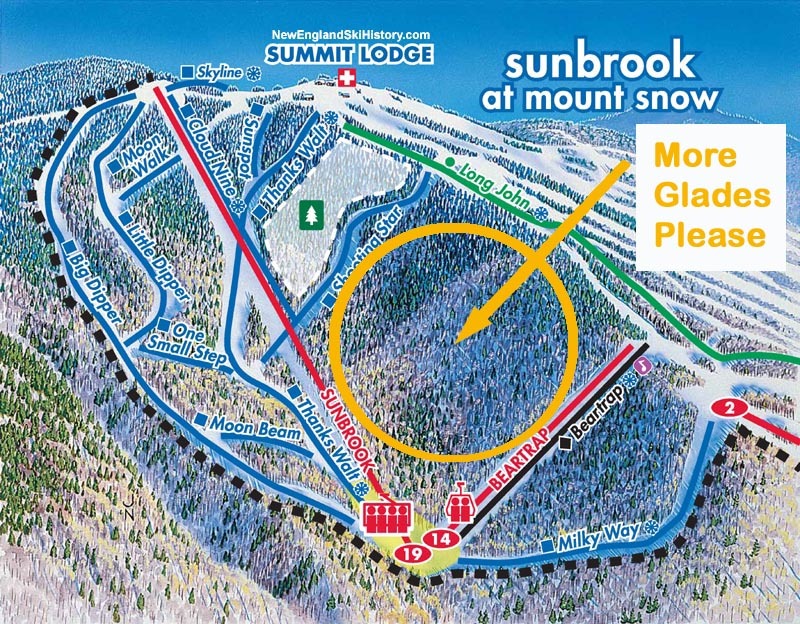 It’s a little steeper pitch than other trails in the Sunbrook Bowl but would offer a much wanted challenge to Mount Snow’s selection of trails. You wouldn’t have to venture over to the North Face which on stormy days is typically closed. This pitch would seem to be similar to a lot of glade skiing at Jay Peak… where it is excellent. 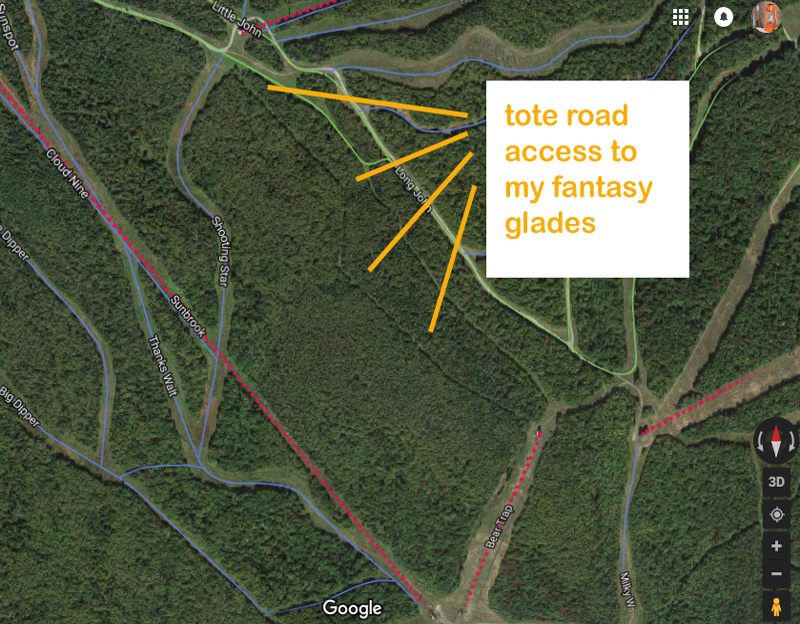 It would seem from the Google satellite image of Mount Snow that the area could be accessed through one of two tote roads which are currently not allowed but maybe they could be???? Providing some more challenging terrain on this side of the mountain may spread things out a bit more with more people remaining on the backside and potentially easing up the lift lines at the base. Coming from a family who has different level of skiing abilities it would be nice to be able to split up and end up back at the same lift which you would be able to do at The Sunbrook Lift. Glade and tree skiing good. More glade skiing even better! Potentially helping the base lift lines. Creating more use of the Sunbrook Bowl. Multiple skiing abilities ending at the same lift! But hey this is all in fun. Clearing trails and getting permission to do so is no easy task. In the mean time enjoy the other glades Mount Snow has to offer. Here’s to a great 18/19 season and always Think Snow! Don’t ski glades late in the day when fewer people are around. You may need help.